Using a meat mallet pound chicken breasts until they are flattened to a uniform thickness, about 1/4 inch. Spread each chicken breast with 1 tablespoon cream cheese. Season with salt and pepper, as desired. Set aside. Heat Presto® Electric Skillet at 250°. Add oil and onion to the center of the skillet; cook about 2 minutes, until onion is softened. Turn off heat control. Remove onions from skillet and place in a medium bowl; stir in spinach and Swiss cheese. 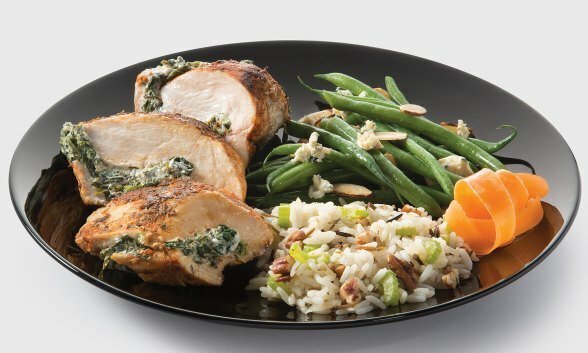 Place spinach mixture, dividing evenly, in the center of each chicken breast; fold up sides. Secure seams with toothpicks. Heat skillet at 250°. Place chicken breasts in skillet. Heat, covered for 9 minutes. Turn chicken breasts, cover and cook for an additional 8 to 9 minutes, until internal temperature of chicken reaches 165°. Remove toothpicks before serving.